The monofin is specifically designed for freediving or finswimming.The blade is a “technology jewel” produced with the most advanced processes using high moduls and high strength carbon fiber, resulting from aerospace sector. Blade stiffness distribution is accurately designed by FEM in both, tranversal and longitudinal, directions, to minimize the transversal bending thus avoiding lateral pressure drops. This engineerized stiffness distribution enable the transversal shape stability, also in strong kicking, thus producing a great thrust with minimal muscular effort (high efficiency). The footpocket is ergonomical and comfortable. It is molded with high quality rubber and can be worn tight yet maintaining a comfortable fit, minimizes power consumption and produces maximal thrust. All monofin subcomponents, blade, footpockets, vertical and horizontal stabilizers, are assembled by qualified technicians. 1. Foot/blade inclination: high angle. 5. The material used is 100 % Carbon Prepreg produced with hot melt impregnation system, using a micro-toughened tetra-functional epoxy resin. 6. 3D-Tech: Proprietary Technology, of CETMA COMPOSITES exclusive know-how, with high pressure, high temperature and high degree of applied vacuum, which lead to a component with 0% void level, without defects, with a uniform matrix/reinforcement ratio across the whole blade. 8. 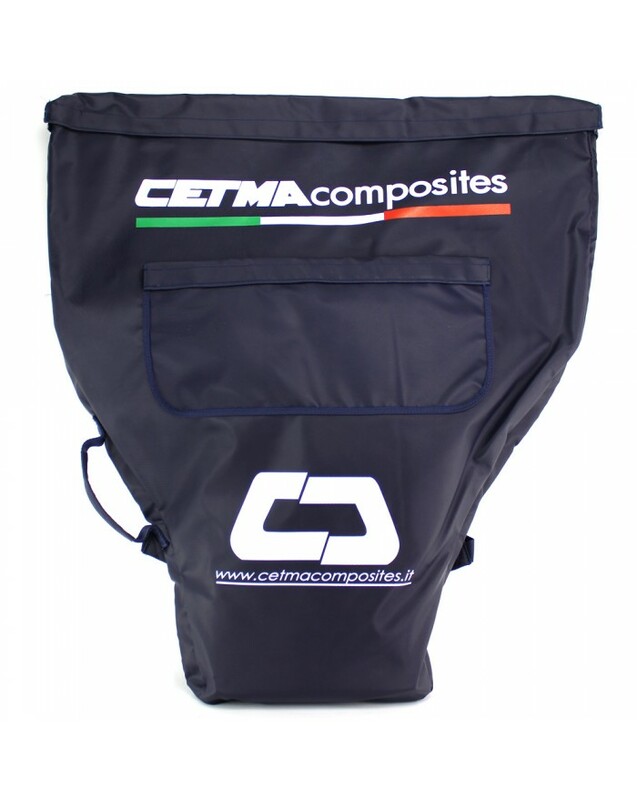 Dimensions: L (Length) = 70 cm; W (width) = 70cm; H (height) = 10 cm. Hi, the footpockets are made to measure, and you can ask how you want the footpocket fit.